A well-crafted compact sedan, the Dart matches its contemporary appearance with good creature features and impressive overall handling. Facing off against rivals like the Chevy Cruze, Ford Focus, Honda Civic, Mazda3, and Toyota Corolla, the Dart offers the choice of three engines, five trim levels and a host of class-exclusive techno touches plus outstanding safety ratings. Dodge dart defects: why I will not by from Dodge/Chrysler again. In the first 6 months of owning the vehicle, my rearview camera went out, I was very unpleasant since I just bought it and I still owed about 13000 on it. Another 6 months went by and I had no problems. Until I started to hear a loud buzzing noise coming from the right side of my vehicle. It would start of very faint then increase in volume when I would approach 50 mph. I took my dart to a mechanic and he informed me that I had cracked wheel bearing and it would cost me about 500 to replace it. Then I proceeded to have my clutch break when I was in a fast food drive through line. I had to push my car to the parking lot so the people behind me could get their food, fortunately it happened there and not on the highway. Again, I was very unpleased. I was the first vehicle I bought and within the first year I already had expensive problems occurring. 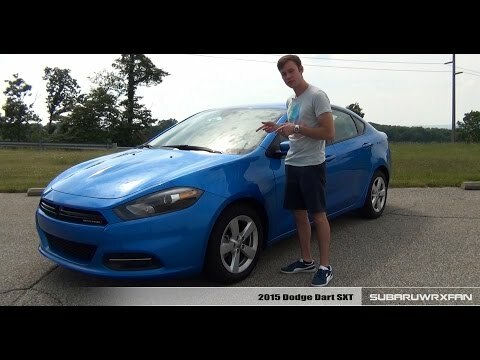 I did some research and there were many complaints on the Dodge dart 2013-2015. I don't think I will be purchasing another vehicle from Dodge/Chrysler again. Five link rear design that combines coil springs, shock stabilizer suspension. I was looking for a car after getting in a car accident. I found this really luckily. It was a great priced used car, with a lot less miles than you would expect for a 2013 Dodge dart. It is a great car and I am really happy with my choice. I love the four doors. The backup camera is awesome. I love the Bluetooth and touchscreen in the interior. The seats are comfy and the gas mileage is great. Overall this car is awesome. Looks good and drives well! There were a few mechanical issues so far but nothing too bad. Just hope there no more while I have this car. The Dodge dart is a really great car for the price. I got one with under 12k miles for under 9000$. The GT is the model I have and the features in there are up to date and very convenient. The raio is a 8 inch display that has movie theater times, GPS, Gas prices around the city. My only issue with the car is insurance companies consider it a sports car and being that I'm only 22 my insurance is very expensive without any traffic violations. The car isn't that fast and paying 400+ a month on insurance is not worth it one bit. Internal damage to brake booster could result in a loss of brake assist, lengthening the distance needed to stop the vehicle and increasing the risk of a crash. Chrysler will notify owners, and dealers will inspect the brake booster grommet for the presence of oil. If no oil is found, the vacuum tube assembly will be replaced. If oil is found, the vacuum pump, vacuum tube assembly, brake booster and master cylinder will be replaced. The recall began on May 9, 2016. Owners may contact Chrysler customer service at 1-800-853-1403. Chrysler's number for this recall is R63. Chrysler (FCA US LLC) is recalling certain model year 2013-2015 Dodge Dart vehicles manufactured February 24, 2012, to June 16, 2015. The affected vehicles may experience failure of the transmission control module (TCM), causing the transmission to unexpectedly shift into neutral. Chrysler will notify owners, and dealers will replace the TCM and bracket, free of charge. Chrysler issued an interim notification to owners on October 14, 2015. The recall began on January 15, 2016. Owners may contact Chrysler customer service at 1-800-853-1403. Chrysler's number for this recall is R42.